So here is what our work boxes look like. I bought the shoe-rack from Tesco online (£12). The plastic shoe boxes were 99p each from a cheapy local store. Below are my boxes for the girls, a different colour each. Sue Patrick recommends clear plastic shoe boxes....but these are what they had in the first store I went into...and I like that they are different colours as I think it will help the kids to know which set is theirs. It looks like a lot of work right! That's what I thought when I started filling the boxes yesterday. But each lesson should take between 5 minutes (for example spelling) to maybe 20-30 min inshallah. I'm guessing if all goes smoothly then maybe it will take somewhere between 3 - 4 hour to complete bi'ithnillah. Below is one of my 3 year olds boxes.....I'm showing this just to show you that in each box, everything they need to complete the work should be included inshallah. This is a craft activity (she loves cutting and gluing....I say gluing because she just likes to pour the glue or wipe the pritstick around but not do anything with it) so in this box we have scraps of paper, card to stick onto, scissors and glue. Below are my 5 year old's first 3 boxes. We have spelling, Jolly Phonics and MEP Maths. Again, to show that everything that is needed for the lesson is included in the box, including pencil, rubber and crayons etc. Sue Patrick instructs you to place the racks beside the child's desk...which I think is the best idea. However as we use the kitchen dining area and table for our school work, there isn't alot of space - I could squeeze the racks in but I don't think we would be able to move! So instead, I am storing the racks in my school cupboard out of the way when not in use (alhamdulillah we have a good size cupboard room where I have a couple of bookcases to store our education resources). And during "School time" I am just going to bring them out into the hall way. 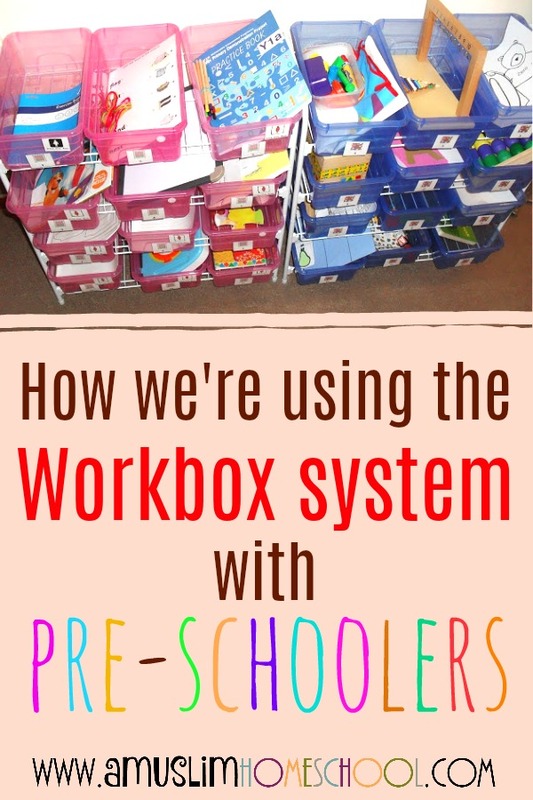 So that's what our workboxes look like. There are also schedule strips and learning centres which I have put together which work as part of the work box system, but I need to go wake the girls inshallah, so I will post about them another time. I just hope all this preparation doesn't turn out to be for nothing! I am really excited about starting this system SubhanAllah. Definitely made me organised for today. May Allah make it a success!